The waterfalls would normally be about 40 meters in width with a drop of 12 meters. In rainy and flood season, Diaoshuilou waterfalls become two or multi-stranded water falls, extending to over 200 meters in width. The Diaoshuilou waterfall is situated near the outlets of Jingbo Lake southwest of Ningan County in the upper reaches of the Mudanjiang River in southeastern Heilongjiang. 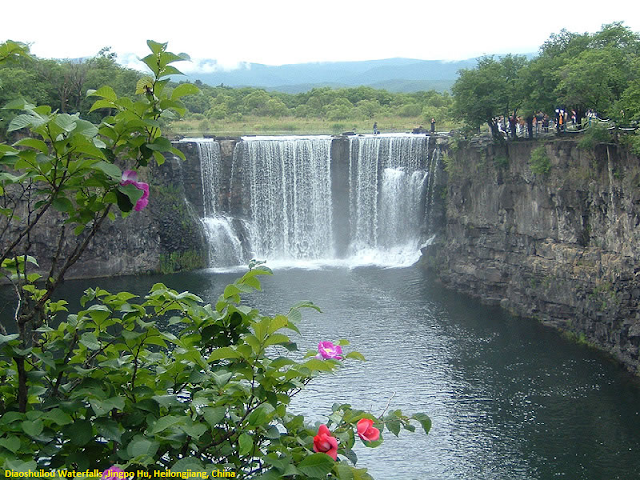 Diaoshuilou Waterfall was created from volcanic eruptions. When the oozing lava met the cool air, it turned into crust, but under the crust some hot airs of the flowing lava were trapped. When the lava become solid cold, the trapped airs found their escapes through the lava crust, leaving many air bubble holes on the lava crust. These air bubble holes late collapsed to become lava caves of various sizes. When water fell off the crumpled lava caves, a spectacular waterfall was then born.